The igLinearGauge control is an Ignite UI control which allows for visualizing data in the form of a linear gauge. It provides a simple and concise view of a primary value compared against a scale and one or more comparative ranges. Gets or sets the brush to use to fill the backing of the linear gauge. Gets or sets the inner extent of the linear gauge backing. Gets or sets the outer extent of the linear gauge backing. Values further from zero than 1 can be used to hide the labels of the linear gauge. Gets or sets the position at which to stop rendering the minor tickmarks as a value from 0 to 1, measured from the front/bottom of the linear gauge. Values further from zero than 1 can be used to make this extend further than the normal size of the linear gauge. Gets or sets the position at which to start rendering the minor tickmarks as a value from 0 to 1, measured from the front/bottom of the linear gauge. Gets or sets the needle breadth. Gets or sets the brush to use for needle element. Gets or sets the width of the needle's inner base. Gets or sets the position at which to start rendering the needle geometry, measured from the front/bottom of the linear gauge as a value from 0 to 1. Gets or sets the extent of the needle's inner point. Gets or sets the width of the needle's inner point. Gets or sets the name used for needle. Gets or sets the width of the needle's outer base. Gets or sets the position at which to stop rendering the needle geometry as a value from 0 to 1 measured from the front/bottom of the linear gauge. Gets or sets the extent of the needle's outer point. Gets or sets the width of the needle's outer point. Gets or sets the brush to use for the outline of needle element. Gets or sets the needle's tooltip template. Gets or sets a collection of brushes to be used as the palette for linear gauge ranges. Gets or sets the position at which to stop rendering the range as a value from 0 to 1 measured from the front/bottom of the linear gauge. Gets or sets a collection of brushes to be used as the palette for linear gauge outlines. Gets or sets the brush to use to fill the scale of the linear gauge. Gets or sets the position at which to stop rendering the scale as a value from 0 to 1, measured from the front/bottom of the linear gauge. Gets or sets the position at which to start rendering the scale, measured from the bottom/front (when orientation is horizontal/vertical) of the control as a value from 0 to 1. Gets or sets the position at which to stop rendering the scale as a value from 0 to 1 measured from the bottom/front (when orientation is horizontal/vertical) of the linear gauge. Gets or sets the brush to use for the outline of the scale. Gets or sets the position at which to start rendering the scale, measured from the front/bottom of the linear gauge as a value from 0 to 1. Gets or sets the stroke thickness of the scale outline. Gets or sets the position at which to stop rendering the major tickmarks as a value from 0 to 1, measured from the front/bottom of the linear gauge. Gets or sets the position at which to start rendering the major tickmarks as a value from 0 to 1, measured from the front/bottom of the linear gauge. 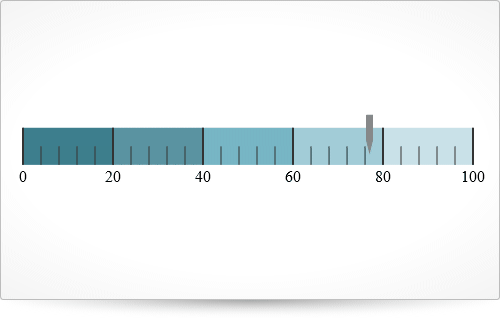 Gets or sets the number of milliseconds over which changes to the linear gauge should be animated. Gets or sets the value at which the needle is positioned. // Get reference to igLinearGauge. Adds a new range to the linear gauge. Returns information about how the linear gauge is rendered. Causes all pending changes of the linear gauge e.g. by changed property values to be rendered immediately. Removes a range from the linear gauge. Updates the specified range of the linear gauge. Class applied to main element: ui-linearGauge ui-corner-all ui-widget-content. Class applying background-image to the fill of the n-th range of the linear gauge. Only gradient colors are accepted. As many palettes can be defined as neccessary. Class applying background-color and border-color to the needle element. Class applying background-image to the outline of the n-th range of the linear gauge. Only gradient colors are accepted. As many palettes can be defined as neccessary. Class applying background-color and border-color to the n-th range of the linear gauge. As many palettes can be defined as neccessary. Class applied to the tooltip element: ui-lineargauge-tooltip ui-corner-all. Class applied to main element, shown when the linearGauge is opened in a non HTML5 compatible browser.